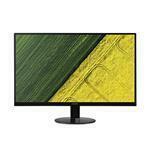 Acer SA230bid is a perfect monitor for both multimedia and gaming PCs. The backlit LED panel with IPS technology delivers stunning colours and fast response time (4ms), ensuring seamless viewing experience incomparable to TN panels. This monitor is an ideal choice for all multimedia enthusiasts looking for a top-quality display to view movies, TV shows and games. The panel comes in elegant thin design that leaves more space for the screen.